> CEO Message From mine sites to factories and offices right across Australia, PCFA’s Ambassador speakers work tirelessly to deliver a vital prostate cancer awareness message to communities and businesses. I am pleased to report that following an extensive consultation process with a representative group of current Ambassadors, we have refreshed the Ambassador presentation and other resources. The new resources include: • Ambassador Handbook • Three new presentations: Prevention and Early Detection; Treatment Options and Challenges; What Partners and Carers Need to Know • Information for organisations on how to request an Ambassador speaker and their role in supporting the Ambassador The great news is that we have a large group of people who want to become Ambassadors. We have organised the first of a series of training sessions for new Ambassadors on February 23rd and 24th. The training will enable our new Ambassadors to get speaking in the community as soon as possible. Starting soon we will also hold State based refresher training for current Ambassadors. The first session will be in QLD in April. This will be followed by training in every State and Territory. We will communicate exact dates and issue invitations to attend in the near future. Information on how to request an Ambassador speaker and all the new resources are available to download from www.pcfa.org.au. As the files are quite large, we have also produced an Ambassador Toolkit on USB, which has been mailed to all current Ambassadors. Thank you to all our Ambassador speakers and keep up the great awareness raising work! FRUCHOCS SPREAD men’s health MESSAGE across SA Adelaide: For the month of December, iconic Adelaide brand FruChoc’s carried a men’s health message devised by Robern Menz and supported by Triple M, Channel 9, GEM and GO! The PCFA message to talk to their doctor was seen on packets of FruChocs across South Australia in supermarkets, petrol stations, convenience stores and cinemas. The campaign was also heavily promoted on air by Triple M and Channel 9 celebrities, sports stars and PCFA ambassadors. Other news: PCFA South Australia was thrilled to be announced as one of Channel 9’s official charity partners for 2013 during their New Year’s Eve Telethon. New South Wales: The ‘Pull ups 4 Prostate’ event was held at CrossFit Marrickville in Sydney’s Inner West on December 22 with passionate event organisers, Emily and Tama, committing $1 for every pull up that the team could smash out. Participants more than delivered, reaching the aim of 10,000 pull ups in just an hour and raising over $10,000 for PCFA. The unique event was dedicated to Emily’s father who has been diagnosed with prostate cancer. of the ride is to capture the spirit of adventure, to heighten community awareness of prostate cancer and raise vital funds for PCFA support services throughout the community. Visit www.malebagride.org.au for further details on getting involved and supporting the Male Bag Ride. Western Australia: PCFA’s WA office recently had a new office fit out, generously funded by Lotterywest. The WA team is delighted with the revamp, saying its had a positive impact on the daily running of the organisation in WA – thanks Lotterywest! New Funding Grants: Movember Young Investigators PCFA’s Research Program has awarded nine Movember New Concept grants (NCG), five Movember Young Investigator grants (YI) and three Movember Equipment grants in the 2012 funding round. In this issue, we outline the Movember Young Investigator grant recipients and their project summaries. PCFA’s Research Program received a total of 83 applications for the 2012 funding round requesting a total of $22,844,180 in the following categories: •	Movember New Concept grants: 54 applications •	Movember Young Investigator grants: 18 applications •	Movember Equipment grants: 11 applications Based on the recommendations of PCFA’s Research Advisory Committee, the National Board awarded nine Movember New Concept grants (NCG), five Movember Young Investigator grants (YI) and three Movember Equipment grants. PCFA also continues to partner with Cancer Australia in the Priority-driven Collaborative Cancer Research Scheme (PdCCRS). In 2012 two grants were awarded. Following is an outline of the Movember Young Investigator grant recipients and project summaries (we will provide an outline of the Movember New Concept grants awarded in the next edition). beneficial treatments can however be delayed (and use of less effective ones continued) if a trial is slow to recruit patients and hence slow (or unable) to report results. This is often seen in cancer related trials. In order for patients to consider trial participation, they need to understand why it is being run, the pros & cons of joining the trial and how these weigh against their own circumstances and values. Although Decision Aids (DAs) have been used in various medical situations, the usefulness of a DA for men with prostate cancer has not been studied previously. The current study aims to assess whether a DA for men considering participation in a prostate cancer clinical trial improves men’s understanding of the trial, helps them make an informed decision about trial participation and reduces decisional conflict and anxiety. be used in clinical trials to help decide whether the drugs should be approved. If the drugs are approved, the doctor can use the marker to help monitor if the drug is working in patients. Dr Michael Cater from Deakin University Can copper be used to selectively kill prostate cancer cells? The overarching aim of this project is to develop an effective therapy for prostate cancer, which targets a distinct characteristic of the disease ‘elevated copper’. Our copper-based drugs in the laboratory selectively destroy cancerous prostate cells without harming normal prostate cells. This project brings together the fields of metallomics and cancer research and is anticipated to have important implications for prostate cancer therapy. resistance. These findings will provide rationale to target insulin pathways in advanced prostate cancer. Dr Gunter’s Movember Young Investigator grant is co-funded by Cure Cancer Australia Foundation. to discover such markers using new technologies that allow us to identify genes that are altered in prostate cancer tumours. Results from this study will have a significant impact on the way clinicians treat patients, which in turn will have a significant impact on the patient’s quality of life. Dr FitzGerald’s Movember Young Investigator grant is co-funded by Cure Cancer Australia Foundation. PCFA Ambassador Program Update The PCFA Ambassador Program was recently refreshed, taking into account feedback from existing Ambassadors, with the updated training delivered to new Ambassadors in Sydney on February 23rd and 24th. The new training package is now being rolled out around the country, with further training sessions being planned for each State and Territory. The refreshed program offers three presentation options to people in the community, being: 1. Prevention and Early Detection. This presentation focusses on what people can do to maintain their health and wellbeing. 2. Treatment Options and Challenges. This presentation looks at decision making throughout the prostate cancer journey. 3. Prostate Cancer:What Partners and Carers Need to Know. This presentation discusses the support partners and carers need to build into their lives as they care for someone with prostate cancer. Each presentation is about 20 minutes in length and allows time for people to ask questions. Ambassadors will additionally be equipped with a set of speaker notes for each presentation providing evidence-based material to help them address questions they may be asked. First established in 2008 with a grant made available from the federal government, the PCFA Ambassador Program is made up of people from the community who deliver information and education about prostate cancer to community groups and organisations. Some Ambassadors are prostate cancer survivors, others are health professionals who want to volunteer their time to the community, some have known someone with prostate cancer, and some are just concerned about the issues and want to support the work of PCFA. What’s consistent is PCFA Ambassadors are keen to communicate accurate information to the community about prostate cancer and its effects. For details on the Ambassador Program visit www.pcfa.org.au or contact ambassador@pcfa.org.au. Mindfulness & Living Well with Prostate Cancer Living Well with Prostate Cancer is a new program of research aimed at finding better ways to support men with advanced prostate cancer. The diagnosis and treatment of prostate cancer is a difficult time for many men. Living Well with Prostate Cancer is a new program of research funded by the National Health and Medical Research Council being conducted by Griffith University and Cancer Council Queensland in partnership with the Australian and New Zealand Cancer Urogenital and Prostate Cancer Trials Group to find better ways to support men with advanced prostate cancer. Men who live in Queensland, New South Wales, Victoria or Western Australia are invited to participate. The purpose of the research is to develop improved services for men with prostate cancer. Men who take part in this program will be provided with support information about prostate cancer by mail and some men will also receive mindfulness sessions over the telephone. The mindfulness sessions will allow men to experience a meditation based program designed to reduce stress. We also ask participants to answer some questions about their health and prostate cancer experiences at different times over a nine month period. to additional financial assistance measures related to Telstra or Sydney Water bill management. For further information contact a local social worker or Cancer Council NSW on 13 11 20.
provided by both PCFA and as part of the “Supporting men with prostate cancer through evidence-based resources and support” grant from the Commonwealth Government (Cancer Australia). Hi Margaret, congratulations on your recent appointment as Convenor of the Fremantle Prostate Cancer Support Group. What was it that compelled you to become involved in a prostate cancer support group? I had recently retired due to breast cancer metastising to the bone when, while at a Lions Club meeting, a request was made for someone to take the minutes and do the correspondence for the Fremantle Prostate Cancer Support Group. Being a forced retired secretary, I thought that I could help but, of course, when I went to the meeting found out there was more to it than I was first advised. The men in the group were happy for me to be the Group Leader and I am still there two years later. Leading the group is stimulating to me. We meet once a month and I have about 35 members on my mailing list. It varies, but about 15 people turn up to meetings. Through what I’m doing for my group, I’ve got something to do for myself and I’m getting a lot out of it. I think it’s good for me, I don’t have time to think about what’s wrong with me. Groups and also utilise advertising in the local papers and word of mouth. 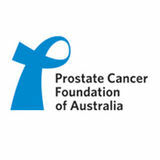 What do you consider to have been the greatest accomplishments for the Fremantle Prostate Cancer Support Group? To see men come to the group who are very depressed and after attending the meeting leaving with a more positive attitude is a great reward. Just being able to help men and their partners deal with a problem that was defined as a old man’s disease – despite the fact that it also affects younger men – is also rewarding. I think the consistency of just being there for people every third Monday of the month is the greatest accomplishment. to see blue out in the community just as much as we see pink. I would love to see a football match dedicated to Prostate Cancer in the manner the McGrath Foundation promotes for breast cancer and to make all men around Australia realise they are not alone and that there is a suppor t group and foundation nearby that can help them. What would you like to see achieved in the next 2 years for the national network of PCFA affiliated support groups? Rural Education Roadshow Program PCFA is pleased to announce a new initiative to bring prostate cancer education to regional and rural communities. The Prostate Cancer Rural Education Roadshow has been made possible through funding from the Department of Health and Ageing. The program will commence early in 2013 and run until March 2014.
he program will fund small teams of prostate cancer experts to travel to selected sites in regional and rural Australia, to deliver a structured educational program to the local health care professionals and the community affected by prostate cancer. expertise in the selected sites to better support those who are diagnosed with prostate cancer. The consumer session will empower men and their families to make more informed decisions, and be active participants in managing their individual approach to prostate cancer following a diagnosis. It is anticipated that the program will be delivered in all States and Territories with support provided directly from PCFA. In addition to the structured sessions, the Roadshow will allow the exchange of information, ideas and practical advice so that prostate cancer patients in regional and rural Australia can benefit from improved services in their locale and improved referral pathways to specialist centres when identified as required. Note: sites for NSW, Tasmania and the ACT will be released at a later date. Jessica Roberts Project Officer – Rural Education Roadshow PROGRAM Jessica joined PCFA in November 2012 after 4 years working on the New South Wales and Victorian border as the Health Promotion Coordinator at Albury Wodonga Health. In her previous role she worked with a range of different health professionals and was responsible for coordinating a wide variety of projects including working with schools, health professionals and projects with the local Aboriginal community. “I definitely think my background working at Albury Wodonga Health will benefit the Roadshow Program,” she says. “Hailing from Yarrawonga in country Victoria, I understand the issues around access to health care and educational opportunities that local communities and health professionals have to face... and this is why the PCFA Roadshow Program is vital to help bridge this gap in rural areas of Australia.” PCFA’s Director of Nursing, Julie Sykes, says the organisation is fortunate to have such a passionate individual in the Project Officer role. “Jessica is very enthusiastic and brings with her a diverse set of skills that will ensure the success of the Rural Education Roadshow Program. We’re very excited to have her on board,” she says. Since beginning in her role, Jessica has hit the ground running, shaping the Rural Education Roadshow Program for 2013. “I’m really looking forward to getting the program up and running as well as working with such amazing health professionals throughout the Roadshow journey and visiting some wonderful local communities along the way,” she says. Nick has been involved in PCFA’s Rural Education Roadshow Program since the initial planning phase and has been instrumental in providing input into the education component of the program. He believes need for the program is clear: “There’s no doubt that rural and country patients have additional challenges to face when they are given a prostate cancer diagnosis because of their distance from treatment centres,” he says. “Distance from the main treatment centre is also a challenge for GPs looking after these patients. Our hospital sends visiting Urologists to these areas, and has established close links with the GPs there. Each area (Port Pirie and Berri) represents a significant patient population that we believe will benefit from specialist education in the area of prostate cancer, specifically how to Live Better with Prostate Cancer. The ethos behind the Rural Education Roadshow Program is an excellent one – to improve quality of care by giving patients and their primary carers the information they need to understand prostate cancer”. Biggest Ever Blokes Lunch Support Network Grows Thousands of blokes across the nation have gathered together for lunches aimed at spreading the important message to check their prostate health and raise funds for PCFA. Conceived by passionate PCFA supporter, Chris McPherson, four years ago, The Biggest Ever Blokes Lunch concept has grown rapidly from a bunch of blokes getting together for lunch in Shepparton, Victoria to an extensive network of annual lunches attended by over 4,000 men across regional Victoria and, increasingly, other parts of the country. While the lunches promote an atmosphere of camaraderie, conversation and laughter, the underlying seriousness of the initiative – prostate cancer awareness – clearly leaves an impression on those who attend. The lunches also highlight what country communities do so well – support each other. The importance of such support becomes all the more evident when considering the staggering reality that men in Rural and Regional Australia have a 21 percent higher prostate cancer mortality rate than men in capital cities. PCFA would like to extend a big thank you to each of the organising committees for their passion and dedication in making the lunches such a success, with an impressive average of 350 men in attendance. We commend their tireless efforts in raising vital funds and, importantly, delivering such a powerful message to men across Australia in an accessible and entertaining way. 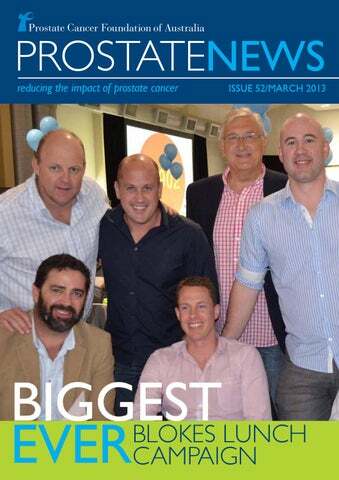 Following on from the success of 2012’s Biggest Ever Blokes Lunch campaign, plans are underway to maximise its popularity again in 2013 – visit www.pcfa.org.au for dates and further information. PCFA is proud to announce it has become an official charity partner of the NSW Waratahs, the state’s representative rugby team with the team’s players getting behind PCFA this season to help raise awareness of prostate cancer. PCFA is thrilled to be teaming up with the Melbourne Victory Football Club as an official charity partner. The partnership is a natural fit, with both organisations focused firmly on health, family and community. “We are delighted to welcome PCFA to Melbourne Victory as our newest charity partner,” Anthony Di Pietro, Melbourne Victory Chairman said. The partnership kicked off at the Derby match on 2nd February with fans supporting PCFA and their team by donating a gold coin for a co-branded blue flag, to raise the profile of prostate cancer throughout the community. The partnership will centre around the team’s big Super Rugby clash against the Brumbies at ANZ Stadium on the 18th May. Keep an eye out for PCFA promotions with the NSW Waratahs throughout the 2013 Super Rugby season. How much is this all going to cost? By David Sandoe OAM and Dr Anthony Lowe How much is this all going to cost? It’s not the first question that comes into your mind when you are diagnosed with prostate cancer, but it is an important one. It is not just the direct costs of primary treatment whether it is active surveillance, radical prostatectomy, external beam radiotherapy, or brachytherapy that need to be taken into account. What about the following potential expenses: • Direct costs of secondary and subsequent treatment such as salvage radiotherapy, androgen deprivation therapy (ADT) and chemotherapy • Direct costs of additional treatment to manage side effects such as incontinence sling or penile prosthesis • Indirect costs of treatment such as travel and accommodation and outof-pocket expenses • Additional life costs such as incontinence pads and exercise programs for men on ADT • Loss of income for both patient and their carer • Additional financial services costs including increased insurance premiums as a result of a diagnosis of cancer. It can all add up to a significant amount. Because the risk of developing prostate cancer rises steeply from age 50, it is often retired men with limited income that face the financial burden. Surprisingly the costs of treatment for prostate cancer and who pays: the public health system, health insurers, or the patient, are not well documented nor well understood by health policy makers, health professionals, or men and their families. opportunity for promotion or in some cases redundancy as a result of a diagnosis of prostate cancer. PCFA is working with a team of health economists at Griffith University, led by Dr Louise Gordon, to answer the question how much is this all going to cost? The research will be used to develop information and resources for men and their families and to help PCFA advocate for a better deal from the public health system and health insurers. We will be launching an online survey in the very near future. Follow us on www.pcfa.org.au and Facebook if you would like to participate. a series of lunches across regional Victoria to build men’s’ awareness and understanding of prostate cancer and to raise money for PCFA. In the words of former PCFA Chairman Graeme Johnson, “We have lost a great bloke and a good friend. It is a tragedy that a fit young man has been taken.” We will miss David, but we will always hold him dear to us in our memories. participating in this initiative, there’s sure to be a Hire A Hubby maintenance team near you.